Turn-und Sportverein München von 1860, or 1860 Munich as they are more commonly referred to in the UK, is a professional football club from the Bavarian city of Munich, who were formed on the 17th May 1860. Originally the club was formed for as a physical fitness and gymnastic organisation. Following various merger’s, the club became known as Turnverein München. A football department was formed on 6th March 1899. 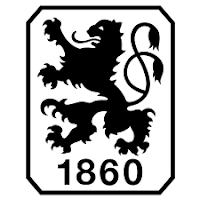 In 1911 the club introduced a lion onto their crest moving into Stadion an der Grünwalderstraße, or Sechzgerstadion as 1860 fans call it, before changing their title in 1919 to TSV München 1860. ‘Die Lowen’; The Lions progressed to Bezirksliga Bayern by the mid 1920’s and progressing to the national semi-final in 1927, before reaching the final in 1931 where they were defeated 3-1 by Hertha BSC. 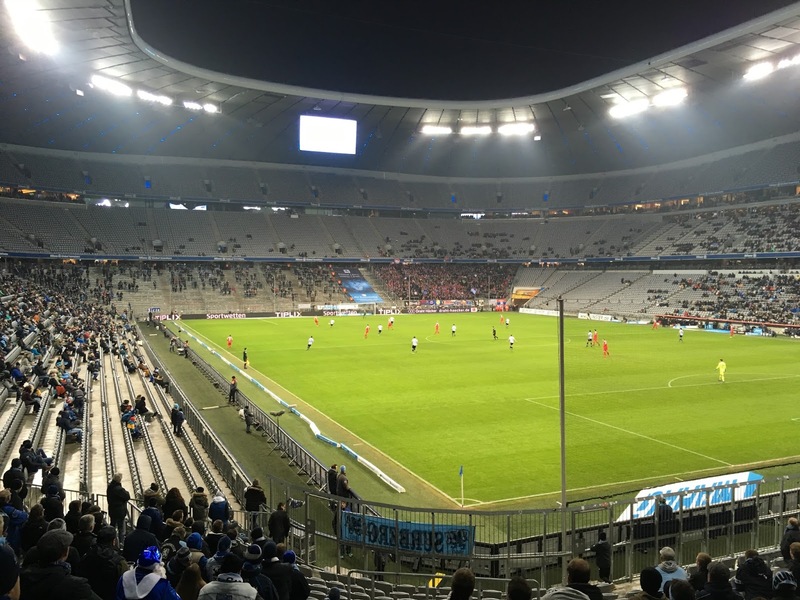 Schalke 04 defeated 1860 in another semi-final in 1933. In 1933 under Third Reich rule, football in Germany was split into sixteen top Gauliga divisions, with TSV being placed in Gauliga Bayern. Second place finishes were achieved in 1934, 1938 and 1939 before the title was lifted in 1941. 1860 lifted their first major honour when they won the predecessor to the DFB Pokal German Cup; Tschammer-Pokal when they defeated Schalke 04 in Berlin in front of 80,000 fans. Another Gauliga title was won in 1934 along with an appearance in the national championship. Die Lowen were placed in Oberliga Süd; one of five top flight regional divisions after World War Two. In 1954 the club were relegated to 2.Oberliga Süd. After winning the title in 1955 and then again in 1957 the club were promoted back to the top flight. Former German and Austrian international defender Max Merkel was appointed as team coach in 1961 as the side won Oberliga Süd in 1962-63. 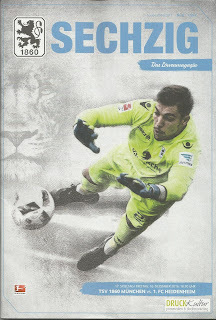 The timing was immaculate as TSV became founder members of the Bundesliga for the 1963-64 season. 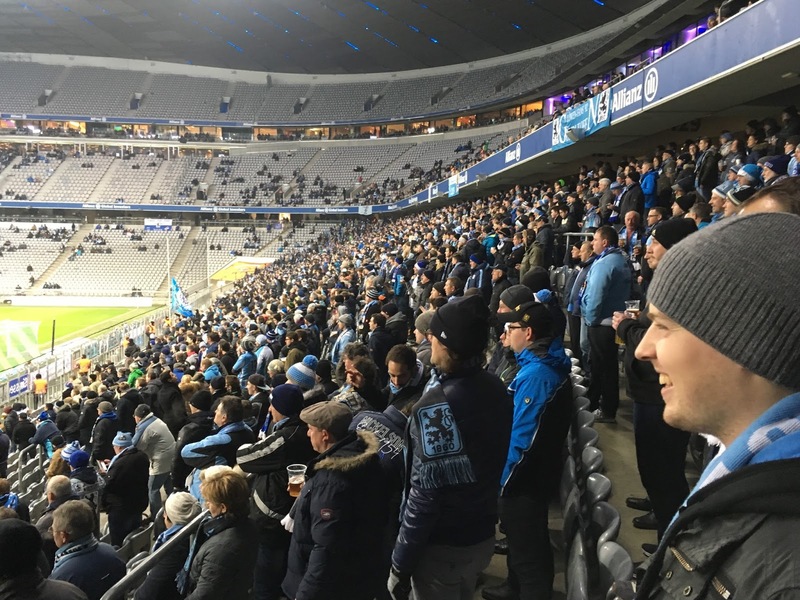 The DFB didn’t want two teams from the same city in the inaugural campaign, so 1860 became members two years before city rivals Bayern. The form continued as 1860 won the 1964 DFB Pokal after defeating Eintracht Frankfurt 2-0 in Stuttgart. This led to entry the following season into the European Cup Winners Cup. Victories over US Luxembourg, FC Porto, Legia Warszawa and FC Torino took the team to the final. In the Wembley showpiece, 1860 were defeated 2-0 by West Ham United. Stars of the time were Rudi Brunnenmeier, Hans Reich and Petar Radenković. Consolation came as TSV were crowned champions of the Bundesliga in 1965-66, before ending as runners-up in 1966-67. Merkal departed and the side gradually broke up as coaches lasted no more than a year. The club were relegated to the second level Regionalliga Süd at the completion of the 1969-70 season. 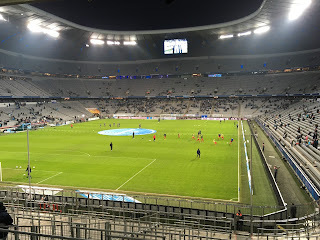 In 1972 the club moved with Bayern München to the new Olympiastadion. Heinz Lucas was at the helm as the team regained their Bundesliga spot as league runners-up in 1976-77. Their spell back in the top flight lasted just one season, before Carl-Heinz Rühl led 1860 to the Regionalliga Süd in 1978-79. In 1981-82 the club were relegated and then sent down a further division to Oberliga Bayern as financial problems led to the DFB denying the club their professional license. 1860 regrouped and moved back to their old Grünwalder Stadion home; becoming Oberliga Bayern champions in 1983-84, 1990-91 and 1992-93 as Werner Lorant became head coach. Austrian international striker Peter Pacult scored the goals as 1860 won a second successive promotion as the club returned to the top flight with a third place finish in the 1993-94 2. 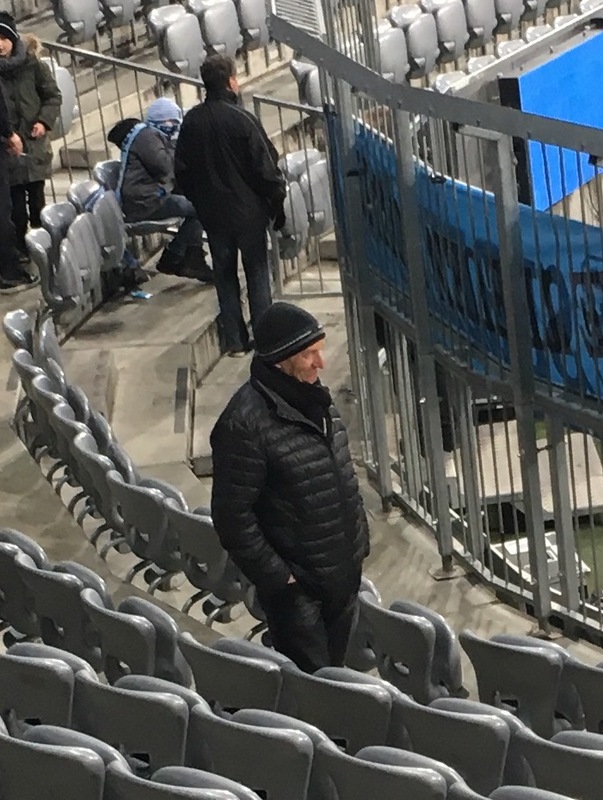 Bundesliga season as President Karl-Heinz Wildmoser oversaw club affairs. 1860 returned to the Olympiastadion as the team made astute signings such as Jens Jeremies, Manfred Schwabl, Olaf Bodden and Peter Nowak. 1860 consolidated their Bundesliga position as Abedi Pele added experience to the front line. German international veteran Thomas Häßler was added to the midfield in 1999 before the team weighed in with a fourth place finish in 1999-00. Lorant was fired after a poor European campaign. Davor Šuker signed on as former forward Pacult took over in charge of the team. 1860 were relegated back to 2. 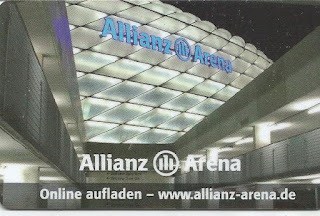 Bundesliga in 2003-04 under Falko Götz, with the club moving back to Grünwalder Stadion for their first season back in the second flight as the Allianz Arena was being completed. Wildmoser was ousted as fans were extremely upset with the upcoming move; exacerbated when he was caught in a bribery scandal that had awarded some of the building contract to his sons company. An eventful 2004 saw Götz, Gerald Vanenburg, Rudolf Bommer and Reiner Maurer all had spells as head coach. The team came perilously close to relegation to Regionalliga Süd in 2006. The club hit severe financial trouble and sold their 50% stake in the Allianz Arena to rivals Bayern so to ease the problem. The transaction convinced the DFB to award 1860 their professional license to continue in 2. Bundesliga. Meanwhile coaches came and went, with Maurer, Bernhard Trares and Walter Schachner all occupying the position during 2006. Marco Kurz took over in 2007. More coaches; Marco Kurz, Uwe Wolf, Ewald Lienen and the returning Maurer couldn’t propel the team back to the top flight as 1860 hit another financial crisis in 2011, as gates continued to hover around the 22,000 mark in a stadium holding 75,000. Bayern offered to help 1860 out financially, which went down badly with fans of both clubs. Bayern were extremely worried that if 1860 went bust, they would be left short of the cost of the rent. 1860 were bought by Jordanian investor Hasan Abdullah Ismaik; although he was only entitled to 49% voting rights under German football regulations. Between 2012 and 2015 more coaches; Alexander Schmidt, Friedhelm Funkel, Markus von Ahlen, Ricardo Moniz and von Ahlen were all employed to look after the first team. 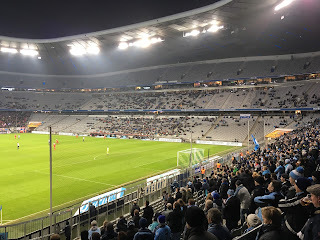 The 2014-15 season saw 1860 avoid relegation when a last minute goal from defender Kai Bülow saw off Holstein Kiel in the play-off as 57,000 fans flocked to the Allianz Arena. 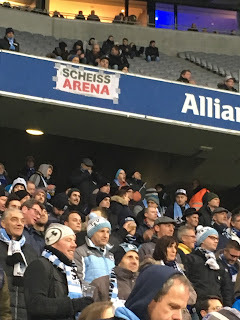 The 2015-16 season saw TSV narrowly avoid relegation once again with Torsten Fröhling, Benno Möhlmann and Daniel Bierofka all having spells as head coach. 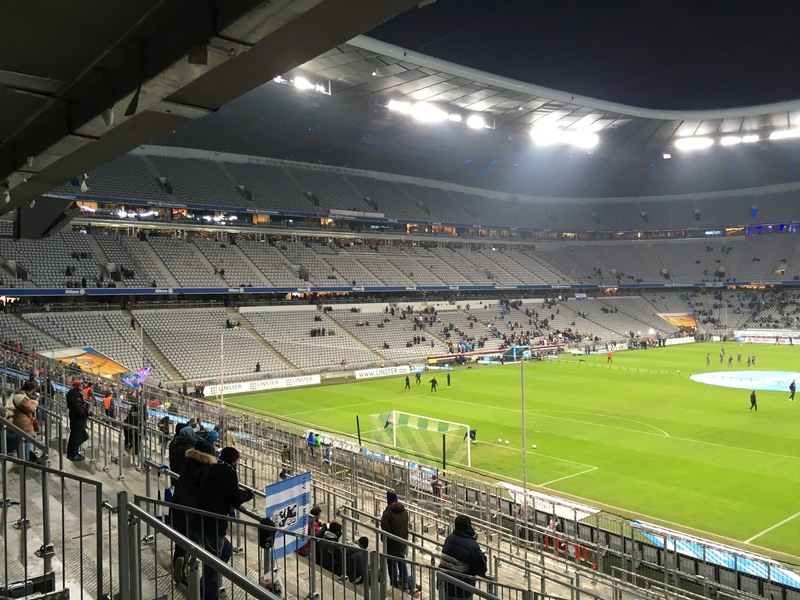 The club began to look for an alternative to playing at the Allianz Arena; although the club had signed a deal to remain there until 2025. The 2016-17 was another of turbulence. Kosta Runjaić took charge of the team before Bierofka returned having received his coaching licenses. However, he was dismissed during the mid season break to be replaced by the Portuguese Vítor Pereira. 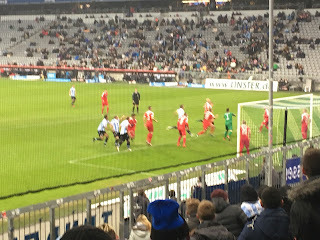 Pereira’s side found themselves in the relegation play off one again where they faced SSV Jahn Regensburg after ending the season in sixteenth place. TSV 1860 München will play in 2. Bundesliga/ 3. Liga in the 2017-18 season. 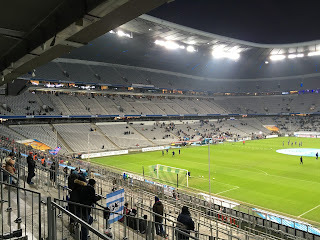 To read about my look at Grünwalder Stadion, click here. 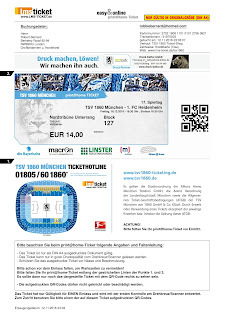 For the trip to Olympiastadion click here. 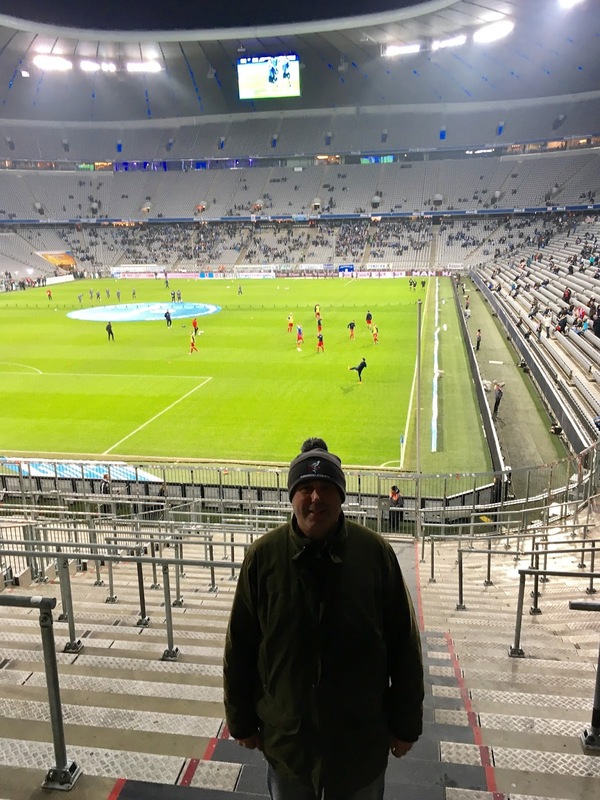 My visit to Munich had lived up to everything I had hoped of and more. 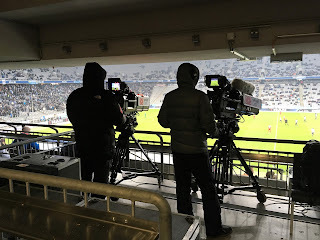 However, I could find only one game of live football to attend. I included visits to three Kreisliga venues; Unterhaching, Grunwalder Stadium and Olympic Park and Stadium as well as a highly recommended walking tour of Dacau which is one of the better things I have ever done in my life. My hotel was in Moosach, which has fantastic transport links and handy amenities. 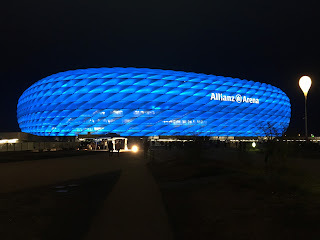 U8, bus and then U6 to Fröttmaning followed by a fifteen minute walk to the breath taking Allianz Arena, which was lit in neon blue. The last time I had seen anything that space age was the Muse gig at Wembley Stadium. 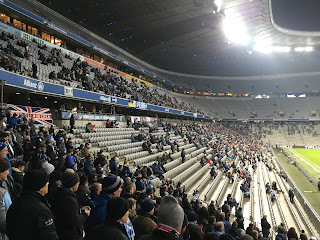 Before being allowed to pass through the turnstiles I had a strict frisking and had to hand my phone charger in to a kiosk to collect at full time. 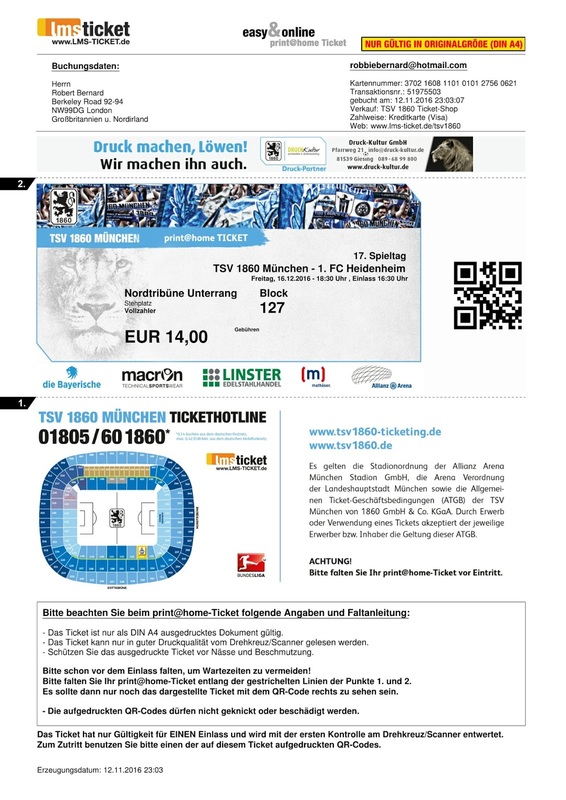 My print at home ticket had been purchased online for €14, with the programme an additional €1.50. The excellent concourse ran all the way around the rear of the lower tier and had fabulous concessions, which were purchased with a stadium card which was given out free and credit added to it. 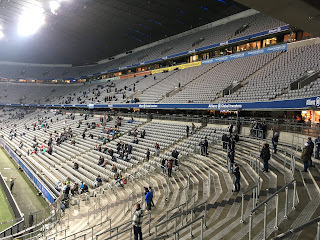 The food on offer was hearty, so I had to award top marks to the stadium designers, who'd obviously been in contact with some leading Bavarian dieticians. How nice it was to enter a new build that had sympathy to those of us with ample girth and long legs as the seating tread and gaps between seats was most generous. The Allianz Arena was a breathtaking venue. 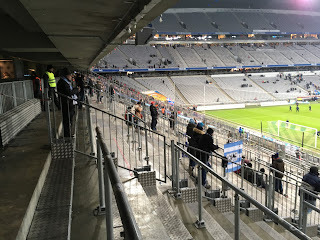 The lower tier had a section of terracing behind both ends with seats down the sides. The middle tier was all seated with corporate facilities towards the rear. The third level undulated to allow air flow to come through the wrap around roof. 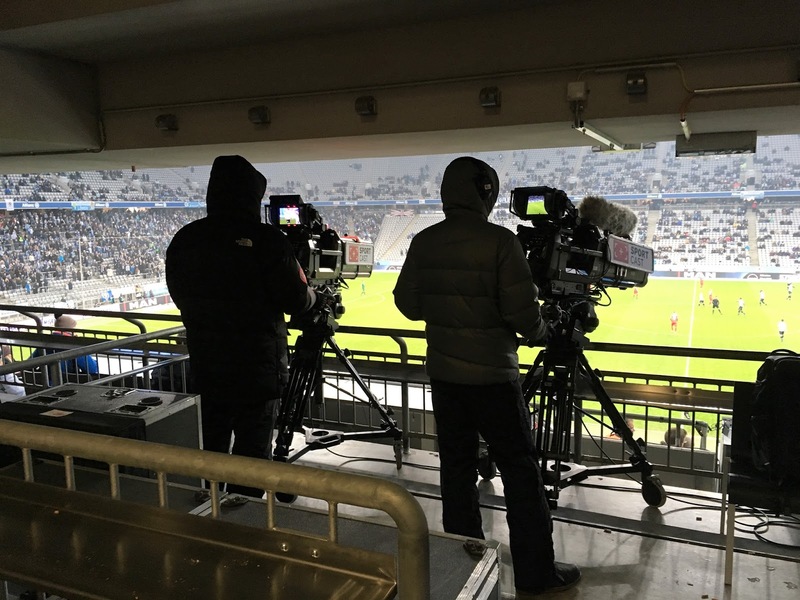 The game began with a slightly muted atmosphere, which built once the struggling Sechzig grew into the game, before they took the lead when Sascha Mölders converted a flick header from a free kick on twenty seven minutes. 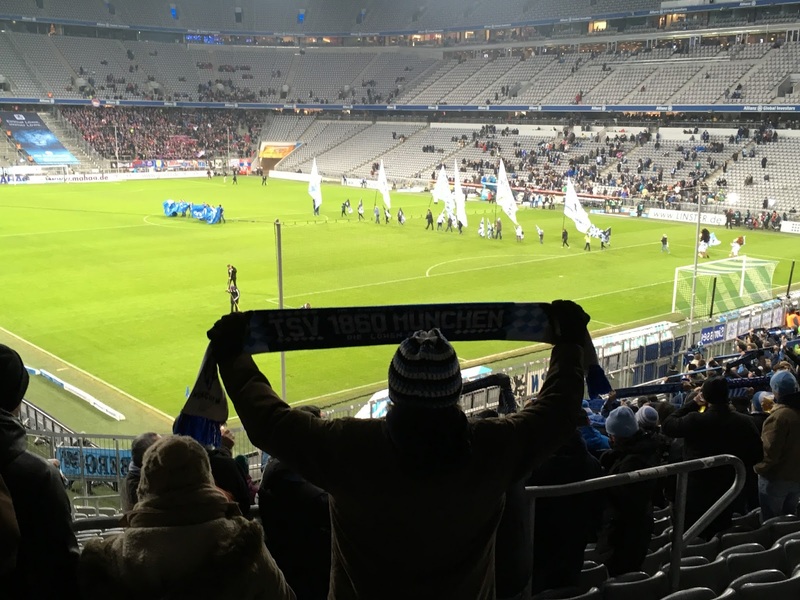 Munich's original club continued to grow in confidence up to the interval. After the break it was more of the same as they attacked the end most populated by their vocal fans, and myself! 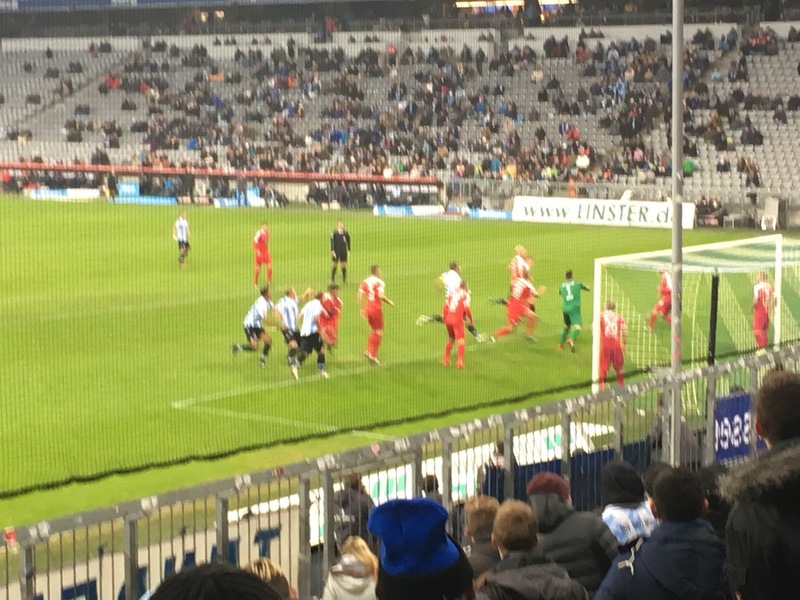 A mixture of poor finishing and a couple of saves from Kevin Müller kept them at bay. München were playing some smashing stuff with everyone putting in a real shift. Referee, Robert Kempter, was also tried to emphasise his presence as he handed out a total of nine yellow cards. He wasn't done there as he awarded a soft penalty to Heidenheim with eighteen minutes remaining. Marc Schnatterer sent Stefan Ortega Moreno the wrong way from the spot to level things up. The home side tried to press for a winner, but it wasn't to be. 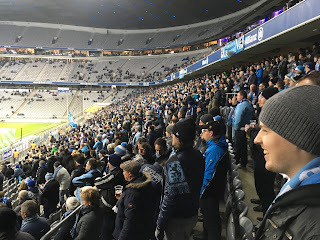 Anyone thinking of heading to a Sechzig game I urge you to go in block 127 towards the front and enjoy the performance a solo supporter. I honestly thought he was going to combust. Even during quiet periods of the game he was off on the prowl like a frustrated detective. When there was a misplaced pass or decision against 1860 he was off into meltdown. Fans were harangued for their opinions and agreement. Even the poor lass selling beer from a tray was getting it, but she just shrugged her shoulders and carried on. I guess she's seen it every home game? He must have covered every place in the first 8 rows during the night. It got to the stage where I was hoping for another 1860 error or a debatable decision. The ref played his part by making some strange calls. He was maybe in on it? The daft thing is that 1860 played pretty well. I'd love to see him in action when they take a pounding. Whoever the gent was, he made a fantastic day even better. 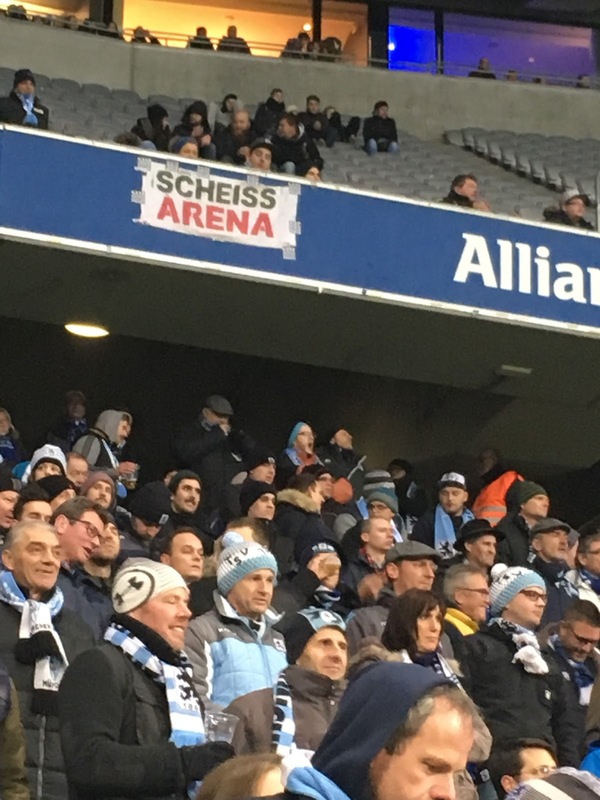 Forza Sechzig! 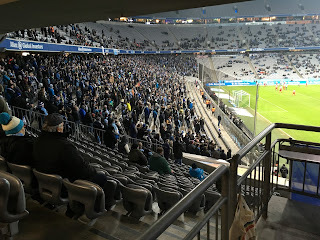 From leaving the ground and waiting for a train, and taking the same journey back to catch the second half of the Hoffenheim against Dortmund match in a friendly bar around the corner from my hotel took me less than an hour. The following morning I was up bright and early and heading to the airport for a 09:50 back to Luton for the extravaganza at Stratford in the Olympic Stadium between West Ham United and Hull City.